A couple of days ago I was so lucky to be invited to CopaJerez 2015, which is a food & sherry pairing competition in Jerez de la Frontera. 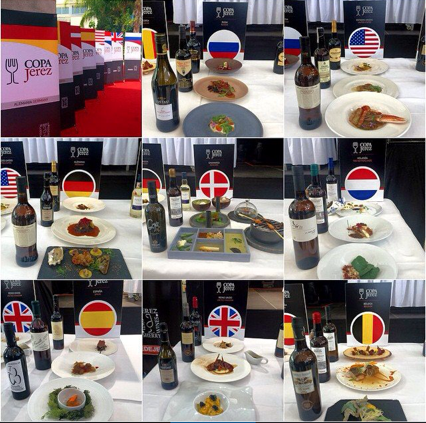 It is a very interesting event, where restaurant teams from 8 different countries compete to achieve the perfect combinations of a 3 course menu and sherries. The countries represented were Spain, Germany, Denmark, Russia, The Netherlands, USA, Belgium and England. The representative from Denmark is a highly recognized restaurant; Kiin Kiin. It is the only Thai restaurant in the world with a Michelin star, so I was very excited to see them here in Jerez. 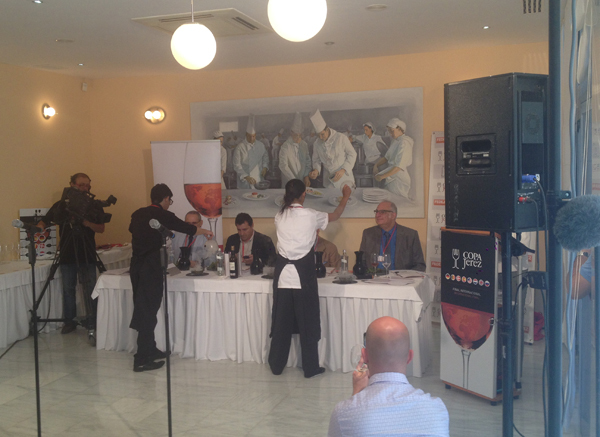 All the teams, led by a chef and a sommelier, were very inspiring. The competition was won by USA, Restaurant 15 Romolo from San Francisco. But the team from Kiin Kiin did take home the prize for creativity, which they truly deserved. I was especially intrigued by a small spicy sausage flavoured with lemon grass, which I later had the opportunity to taste. It was served on plate covered with a lid and inside filled with smoke. When the lids were lifted up by the chef and sommelier in front of the four judges, we; the audience, were for the first time given an insight to the flavours, which these lucky judges were indulging. The room was filled with wonderful scents that immediately sent me back to Bangkok in my back-packing days many, many years ago. Thank you for that experience. Thanyakarn & Simon from Kiin Kiin lifting the lids from the plates and the room is filled with wonderful aromas.. Besides the cooking event, over 40 sherry wineries were there to present their wines, with tastings. Producers of Spanish cheese, sardines and black foot ham were giving out samples of their products. And on a stage, different Spanish chefs showed their skills in show cooking. The show cooking was a bit difficult to follow because of the chefs was performing on a stage. The sound and image on a big screen didn’t reach the audience well, and it would probably be better to do the happening on the floor, where people could take better be a part of it, ask questions to the chefs etc. It is such an interesting event, that I could only wish for it to be open to the public. To let all sherry lovers in, make it a world- known event to promote the sherry, let the wineries and food producers be able to sell their products at the event instead of just handing out business cards. 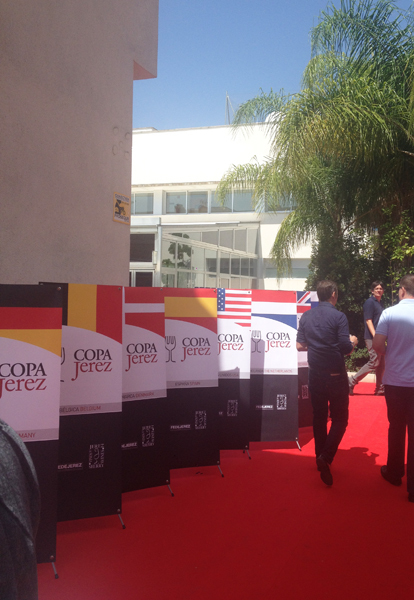 I like the small size of CopaJerez now, but only because I’m lucky enough to be invited. Make it bigger, so everybody has the opportunity to join and enjoy. But all in all; I had a perfect Tuesday afternoon, where my taste buds were in paradise!!!! !